New York's favorite turtles return with a new adventure in this high octane reboot to all previous films after a few years since TMNT. Welcome once again to Dateline Movies. Man, it's been a long time since the last movie review made here. Anyway, with the latest chapter to the TMNT's crime fighting career finally showing, we might want to check this first before we buy ourselves a ticket or more. This marks our second TMNT related review! Manhattan is a city of endless possibilities, a growing metropolis fueled by hope, justice and science. However, a shadowy figure known as the fearsome Shredder, played by Masumune (Inception) has been slowly bringing the entire city to its knees with an army of his own called the Foot Clan. With the growing situation at hand, April O' Neal, played by Fox (Transformers), a Channel 6 reporter and her cameraman Vernon Fenwick, played by Arnett (Monster VS. Aliens) have been investigating the Foot Clan's shady dealings connected to April's long gone father's research. While investigating a Foot Clan activity, April stumbles upon a group of vigilantes and after failing to convince her boss, Bernadette Thompson, played by Goldberg (Sister Act) that they are real, she gets fired from her job. The vigilantes, who later turn out to be a group of mutated turtles have found April and they have taken her to their lair for safety. 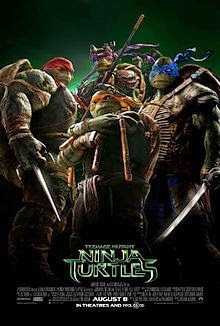 There she meets the team, which comprises of Leonardo, played by Plosznek (Parks and Recreation) and voiced by Knoxville (Jackass), Raphael, played by Ritchson (The Hunger Games: Catching Fire), Donatello, played by Howard (How the Grinch Stole Christmas), Michelangelo, played by Fisher (Battle Los Angeles) and their master, Splinter, played by Woodburn and voiced by Shalhoub (Spy Kids). Together, they have to face the Shredder before he takes New York City down with his iron fist. With help from an unlikely friend from the past named Eric Sacks, played by Fichtner (Armageddon), the Turtles, with April, Vernon and Splinter have to fight before it's too late. But secrets and lies are revealed: What is Project Renaissance and is Eric what he seems? It's all here in this jam-packed epic. It's everything that you would expect from a Michael Bay produced movie. It has spectacular special effects and energetic cinematography. However, there are things that are added to this certain Michael Bay movie. The story is quite interesting as we see the Turtles in a slightly darker tone than before and in addition, the story features some explanation that have been sorely lacking in previous TMNT installments. Admittedly though, there are some details in the story line that you need to accept as a child would. You will need to tap into your inner childhood to avoid questioning just about every detail in the story. Failing to do that will simply destroy the fun of watching. The Turtles gave impressive performances from motion-capture actors and voice actors alike. Their physical look needs a little getting-used-to as I cannot make up my mind if they are realistically scary or too scary just to children. As in most Michael Bay movies, there is a tendency towards overabundance of effects, which can be distracting at times. The other performers gave decent performances although I couldn't help wishing for more facial expression from Megan Fox. I was kind of surprised seeing her in this movie especially with the much publicized falling out with Michael Bay after the release of Transformers: The Revenge of the Fallen. The plot though predictable can be forgiven since we should all know by now what to expect from a TMNT movie: a bad guy wanting to rule and opposed by protagonists previously hidden somewhere. If you have problems with this from the start, then you better watch another movie. Besides, that is essentially how most successful movie plots are formed. It might be overall noisy, predictable or quite corny for some people, but all negative comments aside, I still find it an amazing film, full of action, excitement and humorous performances. I watched this movie to get entertained and got that. With that, I hope you have enjoyed this review of Teenage Mutant Ninja Turtles 2014 here on Dateline Movies. Be sure to Like, Tweet or Share before you leave. Do you have a movie you wish to be featured or a list topic you want to talk about? Comment below, and I might just use your suggestion. Thanks again!